This fragrant herb smells slightly of apples. It has feathery leaves and daisy-like white flowers. The flowers was valued for centuries for their healing properties and is still widely cultivated for medicinal use - the consumption is 5000 tons per year. Its flowers were highly esteemed in medieval Europe in teas and syrups for their soothing and calming effect - as a cure for sleeplessness, as an anti-inflammatory and a gentle antispasmodic sedative safe for all age groups. abscess in the stomach and colon. Dose: 3 to 4 cups of tea a day (½ — 1 teaspoon dried flowers with 1 cup of boiling water — all between meals. It will also help to cope with morning sickness during pregnancy. It plays a roll in the treatment of hormone dysfunction. You can drink a cup of chamomile tea at night for insomnia, anxiety and stress. Warning: Not for people with heartburn. Add 2 tsp. of flowers to a basin of boiling water. Throw a towel over your head and inhale - be careful not to burn yourself. 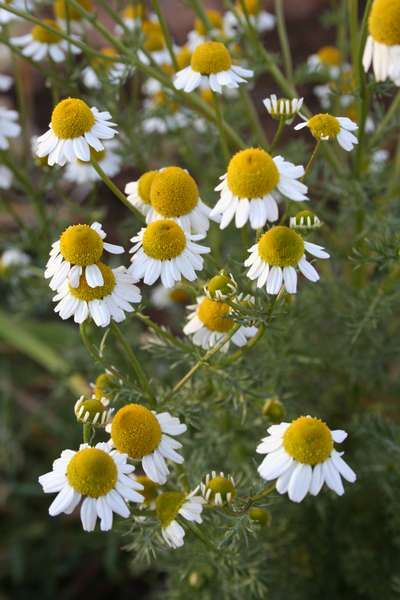 Chamomile is the best single herb for headaches - use it as a tea and as a compress. In longstanding conditions, it will be necessary to continue the tea for some weeks or months to benefit from its cumulative effects. If you dislike the strong taste of chamomile tea, take it weak or blend it with a rooibos tea. Use the tea as a mouthwash for mouth inflammations. It is used in creams to treat inflammations of the skin, including surgical wounds. Chamomile is the most suitable herb for infants and is used for colic, vomiting, loss of appetite, restlessness, nightmares, teething troubles and itchy skin rashes. A teaspoon or two of ordinary strength Chamomile tea, 3 times daily. may be given directly or added to the baby's drink. Another way is to add a cup or two of chamomile tea to the evening bath - It will also help him to sleep.